Diploplia, commonly known as double vision, is a term that Ricardo Jacinto borrows for the title of his latest exhibition. That said, sound rather than sight is at the crux of the Lisbon-based artist’s practice and this show, which consists of a single installation aimed at mixing one’s perception of space and time through a binaural recording. 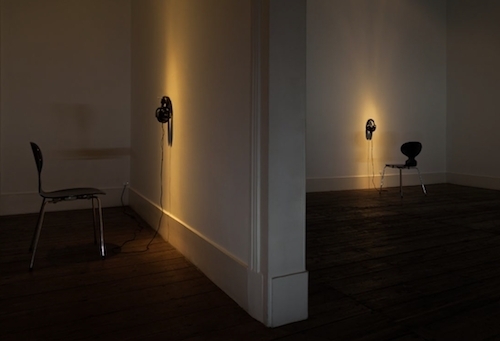 Throughout the gallery, chairs have been positioned expectantly in front of a wall on which a set of headphones has been hung, glowing in a halo of warm light. The sound tracks that play from the headsets are all recordings of a scripted thirty-minute performance Jacinto created within the gallery, which consisted of people scuffling about the room, creaking the floorboards, ringing the doorbell, and opening and shutting doors, among other actions. The artist’s intention was to reproduce the ambient noise that comes when people traverse this space, muddying the listener’s understanding of what is happening in real time and in the recording itself. The entire experience of listening disorients on both a cognitive and physical level, forcing one to actively distinguish between provinces of past and present. What’s especially notable is the way Jacinto uses sound to loop back to sight, as the din activates looking: One lurches behind themselves, set off by quiet tiptoe of feet. By suspending temporal realms over each other, Jacinto creates a ghostly sensorium that reinforces how central the experience of listening is to the experience of seeing.